Do you or your child require a more discreet solution to straightening teeth? 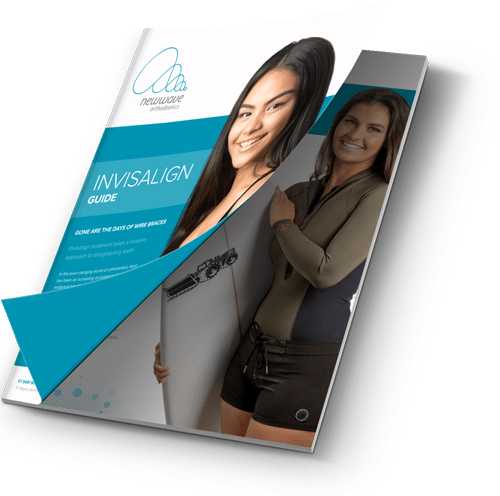 Available at Newwave Orthodontics on the Sunshine Coast, Invisalign is one of our discreet teeth straightening options for teens and adults. At Newwave Orthodontics we are proud to be a platinum elite provider of one of the most popular treatments in orthodontics: Invisalign. Perfect for teens and adults, Invisalign is more comfortable and lifestyle-friendly than other traditional treatments. Very minor cases can start from as low as $2030 while our average Invisalign cost is a very affordable $6040 with payment plans available. Dr Miles will assess your case at your initial exam and give you an exact quote on your Invisalign treatment. Are you an adult who needs virtually invisible treatment due to work restraints or you simply want a more comfortable alternative? Read more about Invisalign for adults! Does your child require orthodontic care but is worried about their appearance or flat-out do not want traditional braces? We offer Invisalign for your teen, too! Read more about Invisalign TEEN! Patients are often concerned that once they hit a certain age, orthodontic treatment is no longer an option. The general consensus is that having braces over your smile looks unprofessional, but having straight teeth has a number of benefits for career development and even relationship development – according to a study carried out by Kelton in the US. Our elite orthodontist, Dr Peter Miles, was one of the very first Invisalign providers in QLD and is also a Platinum Provider of this system. With his extensive knowledge, Dr Miles will be able to discuss the Invisalign treatment and process with you in depth. By using our own Cadent iTero digital impression system, we can take a highly accurate virtual impression of your smile, meaning no more messy dental moulds! This system allows Dr Miles to submit your digital scan directly to Invisalign where they will then manufacture your aligners. It is important to note that your level of compliance throughout treatment will impact greatly on your overall end result. Dr Peter Miles at Newwave Orthodontics uses advanced 3D imaging software to customise the aligners to suit your smile. Using a series of trays, the treatment works by gently moving the teeth into your desired position. Generally the trays will be upgraded on a fortnightly basis. For the treatment to be time efficient and effective, you’ll need to wear your aligners day and night. You can remove the aligners for eating and brushing your teeth but it is important that you wear your aligners as often as Dr Miles recommends. Who is suitable for the Invisalign treatment? For patients who exhibit less complex orthodontic problems like misaligned or crooked teeth, Invisalign may be the appropriate solution. If you have more complex jaw or bite alignment concerns, Invisalign might not be the most appropriate treatment for you. During your Invisalign consultation, Dr Miles will assess your smile and diagnose your condition for you to ensure you are choosing the best solution for your concerns. Dr Peter Miles is a Platinum provider of Invisalign having used it since its inception and is very experienced in discerning its suitability for individuals. Instead of using traditional braces, Invisalign uses clear aligner technology that sits over the dental arches just like a typical mouthguard. These aligners are completely transparent and are custom made to your or your child’s smile for a comfortable fit and virtually invisible appearance. Invisalign is virtually invisible, removable for ease with oral health and maintenance, lifestyle friendly and requires no tightening visits! Did you notice Halle Berry wore Invisalign aligners? Neither did we, but that is the magic of Invisalign! It not only effectively straightens your smile but it does so discretely, no one will be the wiser! Blending dental science with the subtle beauty of art, Dr Miles uses the latest in technology, techniques and evidence-based clinical orthodontics to ensure you receive the best results. 3D imaging software is used to customise the Invisalign clear aligners to perfectly fit your mouth. With the use of a series of aligner trays, the treatment works by gradually moving your teeth into the desired position. The trays are generally upgraded every week until the treatment is complete. For best results, you MUST wear your aligner trays day and night as per Dr Miles’ recommendation (22 hours per day). You can, however, remove them for eating and brushing your teeth. There are a number of benefits to choosing Invisalign as a straightening treatment. Made from transparent, medical-grade materials, the treatment is almost completely invisible and does not involve any metal arch wires or brackets. Research shows that it is generally more comfortable than other orthodontic alternatives. Invisalign aligner trays are removable, so there are no dietary restrictions and you can brush and floss as usual. Minor cases start from $2030, while the average Invisalign cost is $6040. Dr Miles will assess your specific case at your initial examination, and give you an exact quote for your treatment based on your unique needs. We also have payment plans available on request. We help people have lovely straight smiles from all over the Sunshine Coast including Caloundra, Kings Beach, Shelly Beach, Golden Beach, Little Mountain, Battery Hill and all other surrounding suburbs.